With all the hoopla and questions that plagued both fighters for the better part of six years most of the world came to a screeching halt in order to shatter records of attention paid to one single event between combatants. 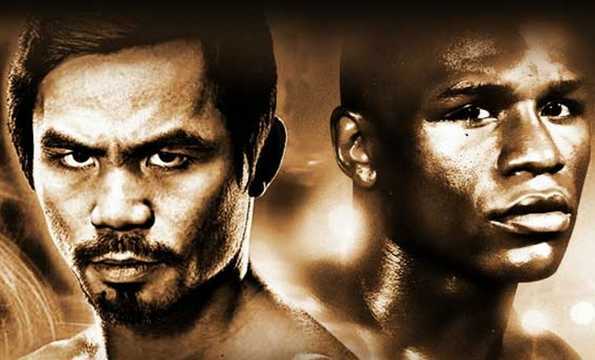 Many tuned in to see if their arguments over the past six years held any weight, would these guys be too far gone, could the Filipino warrior dethrone the undefeated? So much fanfare had been made over this fight that there was no way it could live up to the expectations shy of a stoppage by either fighter. Mayweather for some reason decided that stepping onto the scales on fight night made no sense, of course him doing so would probably end all the nonsense that he himself does not put on ten or more pounds between the weigh in and fight night which is obvious to anyone with a brain. Secondly the cable networks completely screwed the pooch by letting their networks come crashing down just before the main event was said to start. I still stand by the fact that Kenny Bayless was indeed the wrong man to select for the officiating of this bout, while some may argue that he did a decent job there were plenty of illegal veteran tactics he practically played blind to. I'm not a fan of Bayless because he floats about the ring in unusual positions that prevent him from looking at the action straight down between his two charges and misses a ton of stuff in the process. As if those issues weren't enough we come to the two fighters of the night, both fighters who have obviously seen better days. One known for his amazing defense and the other known for his almost maniacal offense. This was supposed to be a barn burner of sorts, all the talk about Floyd chopping wood and teaming up with Alex Ariza led to absolutely nothing but more of the same. We got more of the usual Floyd Mayweather Jr recipe of boxing, jab, check hook, right hand, back peddle. It's a recipe that has worked now in 48 bouts and is for some reason heralded by his most ardent fans and the most vocal of all fans. Manny Pacquaio for his case had promised to shatter Mayweather and end the reign once and for all. What we got was a fighter who had his moments but had truly lost the fire in his belly for the sport. In other words this was a paycheck bout for both men and nothing more. Today we learn that Pacquaio was actually injured for the bout and had needed the approval of medications to deal with a tear in his shoulder from the group at USADA. Pacquaio's people claim they considered cancelling the fight but weren't allowed to due to contractual obligations. The only problem I have with this is that had they put that information out back in March when the injury occurred the public would've demanded the fight be put off and the fighter given time to heal. Nobody would've chucked out a hundred dollars to watch a fighter of his caliber fight the biggest bout of his career at half mast, and I do mean nobody. Is it an excuse? No, there is proof that such an injury did occur despite the denial of NSAC, considering there was a strong testing method for this fight all medications had to be disclosed to that entity and that entity has confirmed that they did indeed get informed of the situation. The difference between USADA/VADA/WADA is that the first of the bunch has a clause that prevents them from disclosing anything to the public before a fight takes place. This was evidenced by the situations with Erik Morales a few years back. The fight certainly did not live up to the hype for a number of reasons, personally I never wanted this fight to happen after 2012 as I didn't believe either boxer was at their top form anymore and I still stand by that regardless of how good Floyd looked sauntering around the ring last night. Second, the size disparity was known even back in 2008 when the earliest rumblings of this fight started. The only way I wanted this fight to happen is if there would be a stoppage. One man can't make the count, that to me is worth the hype of this magnitude. I wanted and expected Floyd Mayweather to beat up on his opponent and send a message and instead I was treated to sights of a man just comfortable enough to do just enough to win a fight. I like both fighters, I have enjoyed both fighters tremendously as athletes with their outside of the ring antics ignored completely. The fact remains that I have seen more action at golden glove bouts than I saw from the #1 and #2 boxers of the sport. People may argue about the sweet science but the sweet science has a place and time. Its time is not at the biggest event of your sports history. Prime example is Vasyl Lomancheko a fighter who is arguably the best amateur fighter in the history of the sport, yet as a professional fighter he's changed his style to suit the platform he fights at. Utter dominance is hard to argue against when you beat on your opponent to the point even he is convinced he's fighting 3 or 4 people. While Floyd is an amazingly talented fighter he had all the tools to do exactly that and instead we got the opposite. How are you such a big man and yet so cautious as to not even want to get in the pocket and trade with a man who looks so inferior to you physically? For all the arguments of greatest ever, he sure didn't look like it last night. Even before this fight I stated this wasn't a legacy fight, it was a generational standing fight and he had the chance to change that but did not. Watching Mayweather follow the count of the referee would've made it a legacy fight but instead coasting and running down the clock seemed to be his idea of showing he's a class above any other generation. I can't picture anyone in my top 5 list historically not going for the kill,I just don't see them satisfied with winning on points when they had almost every advantage possible to win a fight and moreso against an opponent they knew two months in advanced was injured. Floyd will undoubtedly go down as the greatest fighter of his generation but realistically it's an achievement he could have and should've easily eclipsed. The result of this fight leaves more questions than answers but in the minds of each individual fans one has to wonder if they are actually satisfied it happened. Pacquaio "Mayweather is running from a fight like a dog with it's tail between its legs"